This week my two bargain beauty buys come from Pound World. 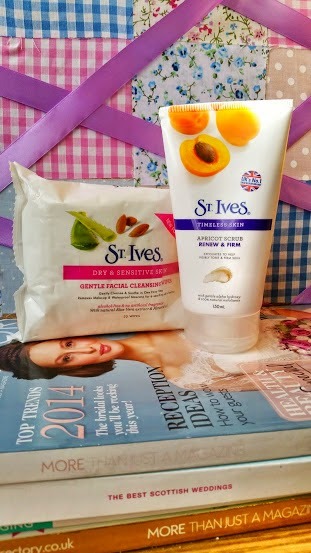 I picked up the Timeless – Renew & Firm Skin Apricot Scrub (150ml) and Gentle Facial Cleansing Wipes from the UK’s No 1 face scrub brand, St Ives. The scrub is an old favourite of mine! It comes in different variations as well as ‘Timeless’ including Sensitive Skin – Gentle, Fresh Skin – Invigorating and Naturally Clear – Blemish Fighting. All of the St Ives scrubs are currently retailing on Boots online at £4.29 so I was thrilled to bits with this bargain! The scrub has a delicate and clean scent and is full of small exfoliating grains that gently help to remove dead skin cells leaving skin cleansed and radiant without being too harsh and drying. The creamy formula leaves skin feeling soft and pampered whilst removing all traces of makeup. This is a brilliant product which I try to use at least 2-3 times a week to help my skin look brighter, firmer and for a more deep clean. I think my skin looks more youthful and healthy after I have exfoliated, this scrub is a very effective addition to any skincare routine. Face wipes are such a handy and convenient must have and I always make sure I have a packet of them on hand. These Gentle Facial Cleansing Wipes for dry & sensitive skin are brilliant for removing tough mascara, erasing makeup mishaps (mines usually involve liquid eyeliner) and for when you simply can’t be bothered with your usual skincare routine. I’ll admit I just don’t always have the time to cleanse, tone, moisturise, apply serum, exfoliate, apply face mask etc, this is an easy and quick one step way to remove makeup and impurities in times of laziness – which happen a lot in my house! The wipes are alcohol-free, have no artificial fragrance and contain natural Aloe Vera extract and Almond Oil so are incredibly gentle and soothing to skin. After a few of my pound shop buys made my October’s Disappointing Products post last month my faith in these bargain stores has now been restored with these two little buys! I also bought a pack of Eylure Pre-Glued Lashes, nail files and a sachet of my favourite hair treatment – Aussie’s 3 Minute Miracle Reconstructor. What do you think about pound shops – have you picked-up any bargains recently? Please leave me a little comment below and follow me on bloglovin, it always makes my day hearing from my lovely readers! "Beauty | Battle of the Primers – MUA Vs Makeup Revolution"